I still don't see the problem... Put a finger on your forehead, then place a headband (or other hat), tilted back so that the band crosses your forehead above your finger. There you have it, the horn remains. Really, the question should be.. where is the horn going when wearing other hats. Honestly it doesn't make sense when the horn simply disappears. The crown simply rests above the horn (sorry- dont have that costume piece so I had to draw an approximation) Anyway I don't think this is a bug, more of an aesthetic decision of the art crew - since the hats you mention are all 'headband' style. I don't think this is a bug, all of those hats allow the top of the head to show, It would look weird if the horn just disappeared with nothing to cover it. Put on something like the top hat or winter hat and the horn is hidden. "An error occurred while starting the game. Check your log for details. Game: Don't Starve Together Version: 305472 Platform: Steam Don't Starve Together: 305472 WIN32_STEAM Issue: After placing a directional sign, many functions of the X-Box controller stop working. I am still able to move around, but many buttons stop working (trigger buttons, shoulder buttons, etc) Disconnecting from the game and reconnecting fixes the issue, but it happens each time. Can someone help me find where wormwoods body parts and things like that are? ...\common\dont_starve\data\DLC0003\anim\ there are several wormwood files Note that inside the zip files are the atlas.tex and build.bin files You will have to use a utility such as ktools (Krane) to unpack the actual images. Can somone tell me how to change a crafting recipe? Thank much... that helped a lot. I have these line in Modmain.lua ================ W101_FLOAT = 0 if GLOBAL.IsDLCEnabled(GLOBAL.CAPY_DLC) or GLOBAL.IsDLCEnabled(GLOBAL.PORKLAND_DLC) then W101_FLOAT=1 end ================ Then In one of several prefabs ================ if W101_FLOAT ==1 then .... ================ However, when the prefab is loaded, the game crashes with the error that the variable is not defined My knowledge of Lua is limited, and I am sure I am missing something iimportant in the way that Lua works.. Any help would be appreciated. Does anyone know if they plan to release other characters? Just wanted to say Kudos on the Outbreak update, I for one enjoy the update. I found it an interesting new challenge to overcome. I agree the auto-disinfect seemed broken, so I turned it off, it was easier to manage manually. Yes, and since the pipes are behind the painting you shouldn't see them. Ergo the 'bug' is that he feels the bubbles should be hidden as well. I was merely pointing out that the purpose of the overlay is to see the bubbles. He certainly isn't implying that he wants the pipes to render in front of the paintings. But if you don't see the bubbles, then it makes it hard to track the fluid movement. @Midrealm, sure! I can add the new tag images, don't exactly understand the difference between seafood and fish tho, is it about froglegs? As for inedible, really tough choice. Do you add 'inedible(alt)' tags into your recipes? RE: seafood - yes - froglegs, although other things could be added (I have been debating including seaweed). RE: Inedible - No - I just use 'Inedible' but I presented the alternate image for your use if you wanted. I hate for users to get confused about what is and isn't tagged a something. I have so many tags because I try to make all my recipes use tags only, so that they can be compatible with other mods. 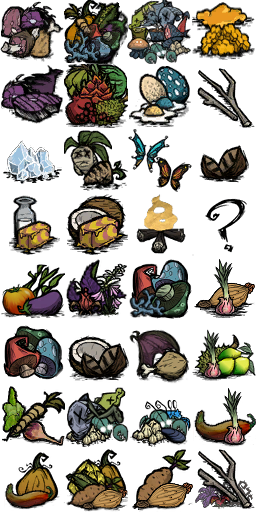 This allows another modder to add a new food ingredient with a tag such as 'seafood' or whatever, and it would work to make recipes in my mod. If i used 'names' instead, it wouldn't work. RE: Square Image, so next possible size is 256x256. ~nod - I figured that out last night when I went to correct the missing Citrus tag. So I have already prepared an new version. Plus I added the tags I forgot and prepared alternate images for some other other tags, like dairy, fat, etc. that include food ingredients from my mod. Again - I'll let you decide how to best use them, if at all.
" I'll realign the image, that was just FYI. " Hope you ahvent done so yet, I hate to waste your time, and I've got one ready to send this evening. 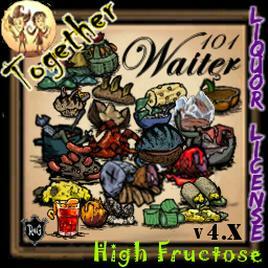 Attached is png and xml with the common food tags and also tags used in waiter 101 mod. I included an alternate image for inedible - because although I've made petals cookable, I have also tagged them as inedible to prevent overuse. 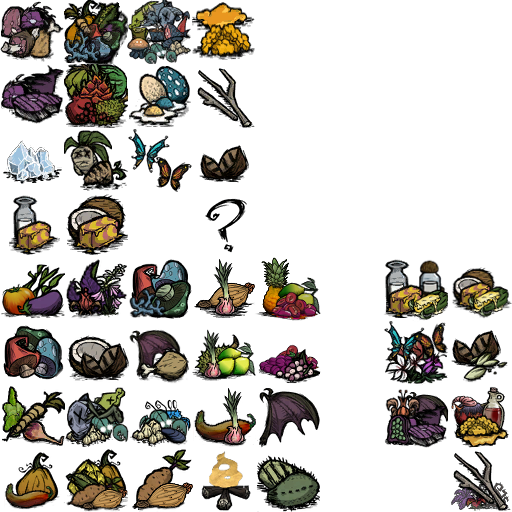 Ideally I would have changed some other core images like monster tag to show plantmeat, bat wings, etc. But that might confuse people who didnt have the waiter mod installed. Anyway - I haven't tested this with your mod, so I don't know if I set up the xml correctly. Feel free to use the attached files or not. Thanks for the update, was about to edit previous image to upload it into game, now I do not have to :). Choosing imageset depending on some conditions seems a bit overly complicated. Really need to implement some automated tag generator. I had this idea about stacking up images of all inedibles inside of one container, and once hovered, all those images spread to make a circle with names next to them. But that's so much UI, not sure if I'm gonna have enough time to make that. Could you make it configurable so the user could choose which image set to use?